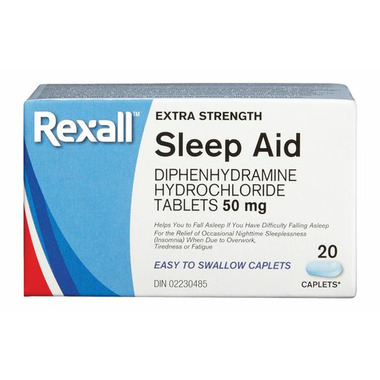 The Rexall Extra Strength Sleep Aid contains 50 mg Diphenhydramine Hydrochloride per caplet. It can help you fall asleep and provide relief from occasional nighttime sleeplessness (insomnia) when due to overwork, tiredness and fatigue. Dosage: Adults and Children 12 years and over: Take 1/2 to 1 caplet at bedtime if needed, or as directed by a physician. In some people, persisting drowsiness may be experienced with a 1 caplet dose, in which case the medication should be subsequently reduced to ½ caplet.